One of the biggest pluses of being a language assistant in France is having a vacation-heavy French school schedule, allowing us ample time for adventuring. Right now, we’re at the tail-end of the Toussaint (All Saints) holiday, which is about a week and a half long in sum. Another assistant and I decided to use this time to escape from the cloudy skies of the North, to sunny sunny Spain. As the title of this blog (taken from a lovely Three Dog Night song) suggests, I had never visited Spain before. Additionally, I knew maybe a total of five Spanish words before vacation: hola, gracias, adios, café con lèche…maybe only four. As we were in Barcelona, where Catalan (a language specific to the region, which kind of sounds like a mix between French and Spanish) is largely spoken, my extremely limited Spanish was usually rendered completely useless, anyway. Linguistic difficulties aside, Barcelona was incredible. Colorful, textured, vibrant, and alive. It’s one of those huge, international cities where, as a traveller, I still managed to feel completely comfortable and unstressed for the majority of the time that I was there (as long as we avoided the tourist-heavy areas). Barcelona is certainly a city of movement, the streets and sidewalks continually filled with locals making their way to work, school, and other quotidian obligations and chores. But all of this movement, the comings and goings, seemed to follow a slower pace, lacking the crazed motion of other metropolitan areas that I’ve visited. The perfect vacation destination. We certainly took our time during our stay there, spending mornings in a local café, sipping on strong Spanish coffee, afternoons wandering around, evenings in bars, nibbling on tapas (Spanish appetizers, including everything from stuffed olives, to cheese, to sausage), and nights chatting with our lovely Couchsurfing host. We managed to hit the major landmarks. On our first day in Barcelona, we climbed up to Parc Guell, a tall hill overlooking all of Barcelona, and its surroundings, with the mountains in one direction, and the sea in the other. We hiked through the surrounding paths, plazas, and archways sprinkled here and there with local artisans and musicians. 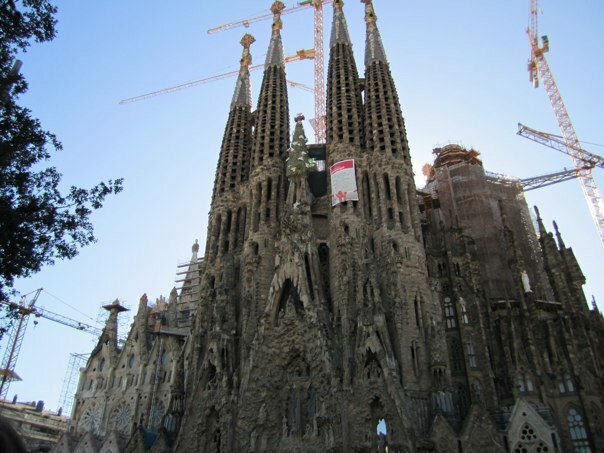 Later in the day, we headed down to the Sagrada Familia, a towering cathedral which, hundreds of years after initial construction was started, still remains unfinished. On our second day, we went to Camp Nou, the major football stadium in Barcelona (my travelling buddy is a huge football enthusiast), going on the full tour of the stadium. Afterwards, we made our way down to Las Ramblas, a large, packed, palm-tree lined street, bordered with tourist-centered booths selling everything from parakeet whistles to flamenco dresses. In the afternoon, we hit the Marina, taking a moment to admire the hundreds of white masts saluting us from the docked boats, before we began to make our way down the boardwalk to the beach. The Mediterranean Sea was as beautiful and calm as I had remembered it: a vivid shade of blue, mirroring the cloudless sky. The beach was packed with other vacationers and some locals, lounging about in various states of dress and undress. Vendors selling and proposing everything from cheap beer to foot massages made their way through the large groups of people scattered across the beach. I think that the only word that truly encapsulates the Barcelona tourist beach experience is “circus.” There are, of course, less populated beaches, but as they were a bit further away, we didn’t really have the time to visit them. After running through the waves and lounging in the sun for a bit, we wandered up to the Gothic area of town. With its network of narrow, cobblestone alleyways, tiny art studios, clothes boutiques, corner cafés, myriad of old churches, and secluded squares, this area was definitely my favorite. On our last day in Barcelona, we returned to the Gothic district, spending all day wandering around and getting lost in its Venitian-like backstreets. As we made our way back to our Couchsurfing host’s flat, walking up the Passeig de Gracia, we managed to luckily stumble upon two of Gaudi’s famous houses, La Casa Battlo, and La Casa Mila. A lovely and exhausting holiday, after which it was oddly comforting to return to my little home here, in Lille.